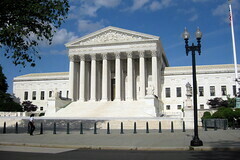 As important as the U.S. Supreme Court decisions are, accessing, reading, and deciphering them can be an arduous task. However, the Supreme Court Database can help relieving some of the difficulty with “SCDB Web 101”. Visitors should click on “View the 101 Lessons” on the far right hand side of the page, to get started. There are four lessons, and they include “Running Your First Online Analysis”, “Making Adjustments to an Analysis” and “Recalling a Previous Analysis”. The database includes the decisions from 1958-2008, and visitors should click on “Analysis” to start their search. For those who know the name of the case, or the volume and page, the search function on the far right hand side, top of the page, will accommodate that. Those visitors looking for cases by “issue”, “outcome”, “type of party”, “court era”, or “writer of the majority or minority opinion” should use the form starting in the middle of the page. This website allows for some great results for those interested in trying to establish themes or similarities across Supreme Court jurisprudence.